There are very few companies that can claim to have had as big an impact on the world as McDonald’s. 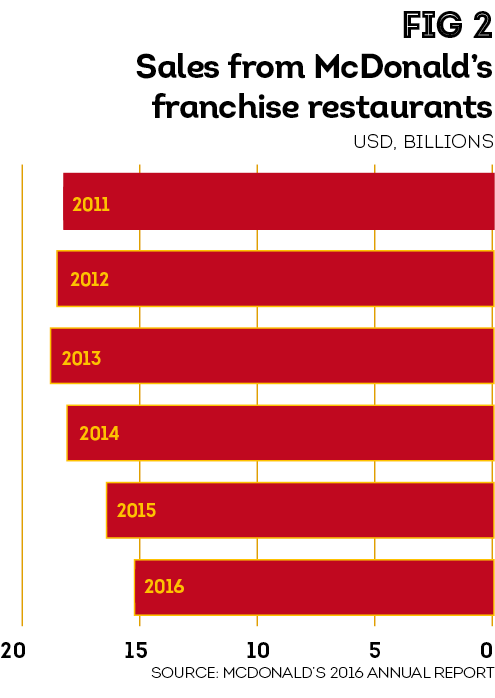 From humble beginnings, the fast food chain has grown to wield the sort of global influence that is often reserved for finance or technology companies. A true household name thanks to its 36,000-plus locations over 100 countries, a modern cityscape just doesn’t seem right without its own branch. The McDonald’s business model, revolutionary at its outset, has allowed the company to expand while still keeping a focus on local communities and their tastes. A 1995 study by Sponsorship International in Germany found that a greater proportion of respondents recognised the McDonald’s logo than they did the Christian cross. 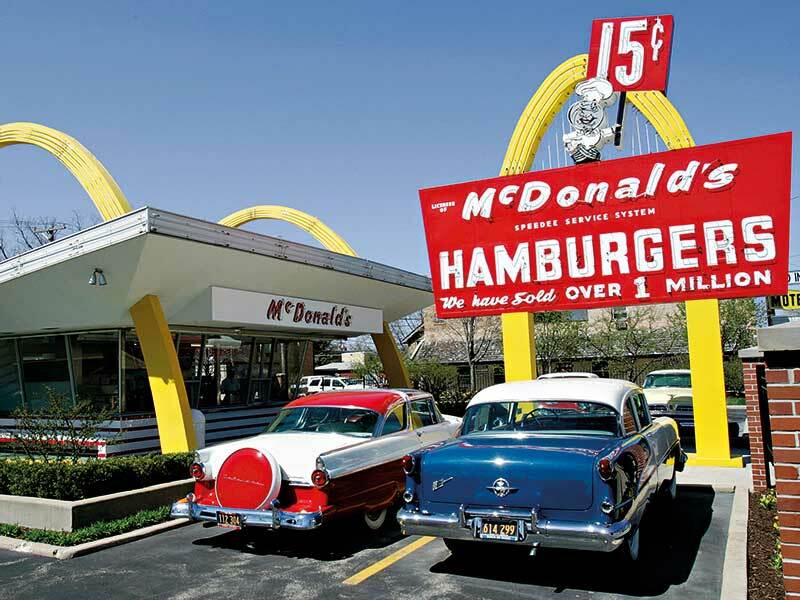 However, today McDonald’s is no longer the new kid on the block, and more modern restaurants have drawn customers away from the fast food format pioneered by the ‘Golden Arches’ (see Fig 1). Despite the company’s almost unmatched market presence, it has been slow to adapt to the rise of ‘fast casual’ restaurants. It is also bruised from various campaigns that have attacked its business practices, its marketing campaigns and the content of its food. With all these pressures beginning to impact its bottom line, in 2015 McDonald’s then-newly appointed CEO Steve Easterbrook famously declared that the business would begin a transformation to become a “modern and progressive burger company”. McDonald’s has indeed made progress, but with its international arms stuck in the experimentation phase, the company is still figuring out exactly what its future will look like. Whether this will see it become a French patisserie or a rather more automated experience, eating at McDonald’s in the future will likely be a very different experience to what it is today. But after revolutionising the food industry once, only time will tell if it can do so again. McDonald’s history is tied to the surge of drive-in eateries that emerged in southern California during the 1930s. The McDonald brothers, Maurice and Richard, worked as prop managers for Hollywood movie studios before they went into business for themselves in 1932, purchasing an old movie theatre on a shoestring budget. After seeing the overwhelming success of a hot dog cart across the street from the theatre, they decided to enter the restaurant business in 1937. Their first restaurants were successes, but the brothers noticed that, despite generally being full, they were unable to significantly increase their customer count or profit. Spying the opportunity for even greater growth, they took a gamble on starting a new burger restaurant from scratch. The restaurant they opened in 1948 would transform the food industry. Stripped down to the barest of components, the limited menu was prepared on an assembly-line-style system, with speed and simplicity the main focus. Food was prepared to order, with workers making every burger fresh while still maintaining attention to detail. Customers were given their food at the counter, meaning there was no need to hire floor staff. The hamburgers, fries, soda, coffee and milkshakes that were sold were cheap and were soon beloved by locals. In 1954, the restaurant caught the attention of businessman Ray Kroc, who was surprised to learn that eight of the large milkshake machines he had sold were being used in a single location. In Kroc’s 1977 autobiography Grinding it Out, he recalled the excitement he felt when he first saw the simplicity and effectiveness of the McDonald’s operation. Kroc saw the potential this establishment had – and the opportunity to sell more milkshake mixers – but the McDonald brothers initially said they were content with the small operation they had established. Undeterred, Kroc struck a deal with the brothers that would allow him to open a series of franchises of his own, based on the McDonald’s process. They were a wild success, and by 1960 McDonald’s had become a nationwide sensation, with its chain of franchised restaurants grossing $56m annually. However, relations between the McDonald brothers and Kroc grew sour, with each feeling entitled to a greater share of the operation than they received. Kroc eventually bought the brothers out for everything except the original location. He then opened a McDonald’s chain across the street from the original store and cut the McDonald brothers out of the company’s history. It would take until 1991, seven years after Kroc’s death, before the company acknowledged the McDonald brothers on the company’s ‘founder’s day’. Despite the countless fast food imitators that emerged in its wake, McDonald’s remained the leader of the industry for decades. Its model of food – quickly prepared and both ordered and served at the counter – was efficient, cost effective and, most importantly, loved by the public. The structure of franchised businesses, which roughly 80 percent of the company’s stores still observe today, gives each store a substantial amount of autonomy. The impact of the company was just as great abroad as it was at home in the US. In 1996, the franchise’s global success and prosperity was used as the basis of a political theory put forward by author Thomas Friedman, who proposed that any country with a McDonald’s within its borders wouldn’t go to war with another country with its own McDonald’s. This assertion proved false in 2008, however, with the beginning of the Russia-Georgia conflict. After the peak of its success in the 1980s and 90s, McDonald’s became the subject of increased scrutiny by the public and health organisations. In 1986, the environmental anarchist group London Greenpeace (no affiliation to the international organisation) distributed flyers attacking McDonald’s for its treatment of both animals and workers, its destruction of rainforests, and encouraging litter. McDonald’s engaged in a libel battle with members of this group in a case that dragged on until 1997, but the trial was more damaging to its reputation than the allegations themselves – a multinational corporation attacking a few protestors was compared by many to David and Goliath. Investigative journalist Eric Schlosser’s 2001 book Fast Food Nation took aim at the practices and poor nutritional content within the fast food industry, including McDonald’s, which became the basis of a film of the same title released in 2006. 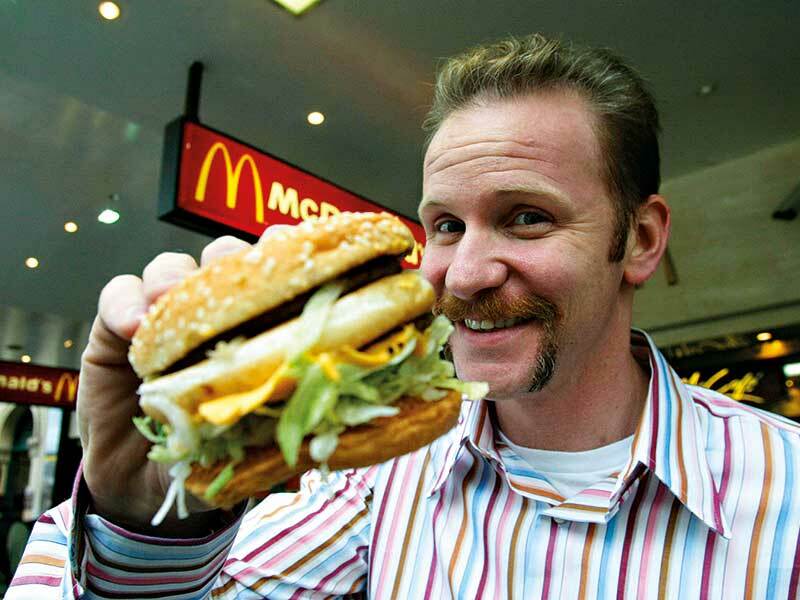 In 2004, documentarian Morgan Spurlock released Super Size Me, a gonzo-style film where he only ate McDonald’s for a month. Predictably, he saw his health significantly deteriorate. However, this string of bad press, combined with growing public interest in the company’s practices, contributed to a sales slump McDonald’s has endured ever since. In January 2017, the firm announced US sales had dropped 1.3 percent over the previous quarter (see Fig 2). Sales in US stores dropped for the first time in 18 months, and group-wide revenue fell five percent. While menu changes like the all-day breakfast offered short-term boosts, they were unable to sway American consumers to make McDonald’s a regular hangout. A note of positivity came from its international business arm, with sales rising 3.8 percent beyond the US. However, simply moving away from salty food is not enough for McDonald’s. Despite its popularity being slowly eroded, the firm has spent years building up a customer base with very specific expectations as to the food they will receive. While public relations setbacks may have gradually battered consumer belief in McDonald’s, the other threat the company is facing comes from the dramatically changing restaurant landscape. Whereas McDonald’s may have once counted its biggest rivals as being franchises like KFC and Taco Bell, boutique chains and independent players are now encroaching on the company’s core demographic. Boasting a more modern restaurant setting, a streamlined menu and a focus on fresh ingredients, fast casual chains like Chipotle, Five Guys, Shake Shack and Bareburger have won over a huge wave of customers. They usually offer some form of limited table service and charge slightly more than a traditional fast food establishment. The rise of the fast casual restaurant has dramatically shifted the dining habits of US consumers. Another edge is the more limited menu these chains offer. McDonald’s core menu has increased to dozens of items, whereas many of these newer restaurants only offer a few. “You have so much more of a scope with three things on the menu than 20”, Alvarez explained. “You can’t really customise anything significantly when you have 20 different things on the grill, there’s only so much space.” In some ways, these chains have recaptured the simplicity that attracted Kroc to McDonald’s in the first place: a limited menu with a focus on food made fast and well. Also competing against McDonald’s are small, individual operations set up by well-known chefs. Big names such as April Bloomfield and David Chang have opened their own fast casual restaurants, injecting a sense of creativity and diversity into the sector that McDonald’s just cannot match. While perhaps not a threat on their own, in sum these single stores are putting a huge pressure on the industry. The last piece of the puzzle may be the store environment. 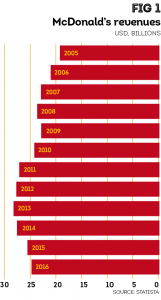 In the US, many McDonald’s restaurants have not seen significant refurbishment for the better part of 20 years. From seating to the way food is displayed, McDonald’s is in some ways looking very out of touch. After being a leader in the industry for so long, McDonald’s is a company unlikely to settle for second best. While it has been slow to change in the US, internationally it has been constantly experimenting with new store formats and menus. At the end of 2014, McDonald’s opened a store called The Corner in Sydney, Australia. The restaurant looks a lot more like a café than a regular McDonald’s, with a menu featuring quinoa salads and pulled pork sandwiches. Last year, the company launched a McCafé in Paris that served club sandwiches, pastries and soups instead of the typical burgers and French fries. While regional differences have always been apparent in McDonald’s menus (like shrimp burgers in Japan and curry bowls in India), these experimental stores are turning the idea of what McDonald’s can be on its head. One location where McDonald’s has been continually successful – and so may offer a window to the future of the company – is the UK. McDonald’s opened its first UK location in Woolwich, south-east London, in 1974. 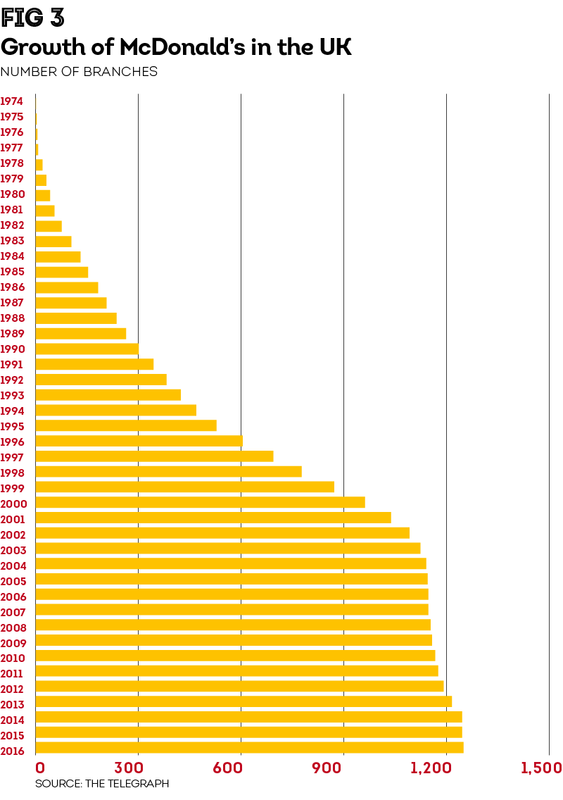 By 1993, the number of stores in the country had grown to 500. Today, there are more than 1,250 (see Fig 3). Trish Caddy, a foodservice analyst at market research company Mintel, said that in the UK market, McDonald’s has been undergoing a transformation into an all-day dining concept: “It’s now offering barista-style coffee, lighter meal or snack options, as well as pushing its 24-hour offers, especially when London launched its Night Tube in 2016. So it has repositioned itself as ‘we’ve got breakfast, you can come in for very cheap barista-style coffee, you can also have a snack, any time of the day’.” Caddy added that, in comparison to its competitors, the company has done this very well. McDonald’s in the UK is also modernising both its restaurants and its services: customers now have the option of placing an order on large interactive touchscreens, and a mobile order and pay app is currently being trialled in selected locations. Ultimately, the priority for McDonald’s in the UK appears to be giving customers more reasons to visit and more reasons to choose the brand over the multitude of other options that have opened up. While places like pubs and coffee shops were never McDonald’s competitors before, as they operated in entirely different markets, all are now competing for the same diners. Though the franchise is in a difficult situation back in the US, internationally McDonald’s has proven it is capable of modernising and adapting to the changing tastes and expectations of its customers. Alvarez said: “It does seem that the company is experimenting fervently to see what sticks… They want to still be relevant, and they want to still be significant, and as it stands they still are significant; their market share is just waning.” Alvarez added that, while no company stays on top forever, anyone who is considering McDonald’s to be out of the game doesn’t understand how much of a hold it has on the industry. While McDonald’s may be facing challenges, the company has time and time again proved it is capable of changing to meet new customer expectations. With its international footprint, McDonald’s has the perfect laboratory to test out the ideas that will come to define its future. While not there yet, it still has the potential to transform into the modern and progressive burger restaurant it is determined to be.